Fabric banners softly billow in the light spring breeze throughout the Dallas Arts District. With a pastel palette, the banners subtly call attention to the widely-talked-about, highly-anticipated first-ever SOLUNA International Music and Arts Festival, taking place now #NearbyMuseumTower. SOLUNA is officially described as "a three-week festival that will showcase internationally-acclaimed guest soloists, artists and ensembles in visual and performing arts along with the leading companies and ensembles in the Dallas Arts District and beyond." This year's theme, Destination (America) is a nod to creative geniuses who found their place in the home of the brave. Not only is SOLUNA's programming absolutely astounding, holding the eyes of international attention on Dallas, it is also amazingly accessible. Museum Tower homeowners enjoy the luxury of living in the best location. No other residential high-rise is as close to the venues where many SOLUNA performances take place, such as the beautifully designed Morton H. Meyerson Symphony Center. Located just 0.2 miles from our 42-story high-rise, this is a world-class destination quite familiar to and frequented by Museum Tower homeowners. The Meyerson Symphony Center is also a sight that can be seen from east-facing Museum Tower residences and even through the sweeping windows of Museum Tower's state-of-the-art fitness center. Additionally, a great deal of events are free to the public and just $19 can purchase a ticket to witness the world-premier of work by Swiss visual artist Pipilotti Rist set to sounds of the critically-acclaimed Dallas Symphony Orchestra. Read on to see our list of the must-see performances throughout the festival. For timely reminders and updates about these performances taking place #NearbyMuseumTower follow @MuseumTwrDallas on Twitter and like Museum Tower Dallas on Facebook. May 6 | 7:30 p.m. This is the night that will go down in history. The official opening ceremony of the first-ever SOLUNA will take place less than a half-mile from Museum Tower, the 42-story high-rise located in the beating heart of the arts district. 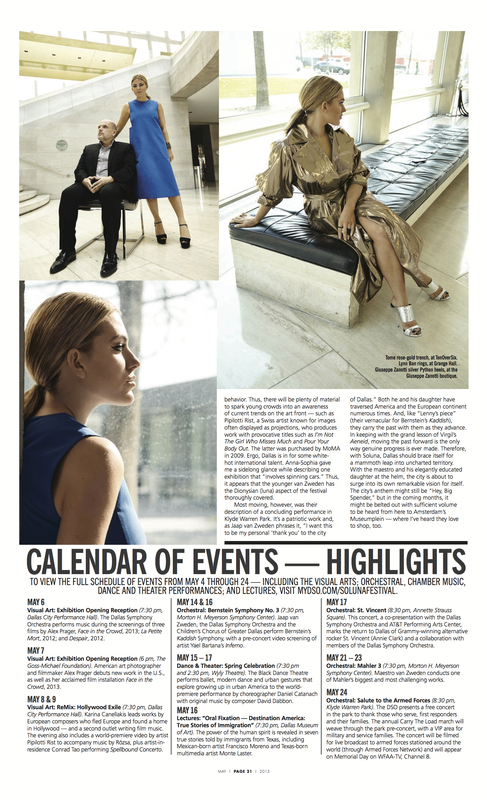 With Karina Canellakis waving the baton, the Dallas Symphony will perform an incredibly dynamic program set to the screenings of internationally-acclaimed films by American art photographer and filmmaker Alex Prager. 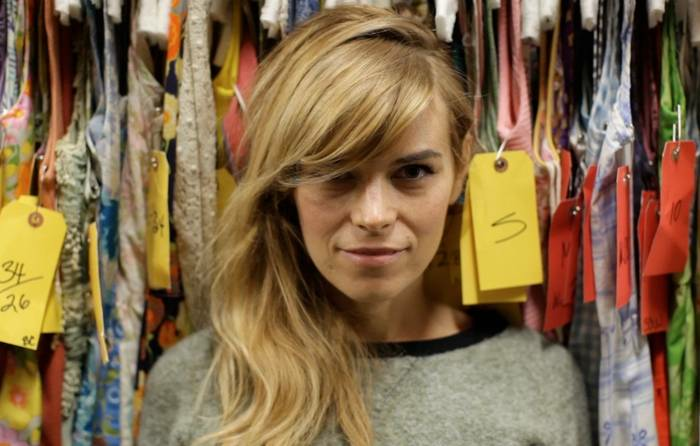 This performance also features original music by Emmy-winning composer Ali Helnwein. Architectural wonder comes together with mariachi, folk, jazz and more. 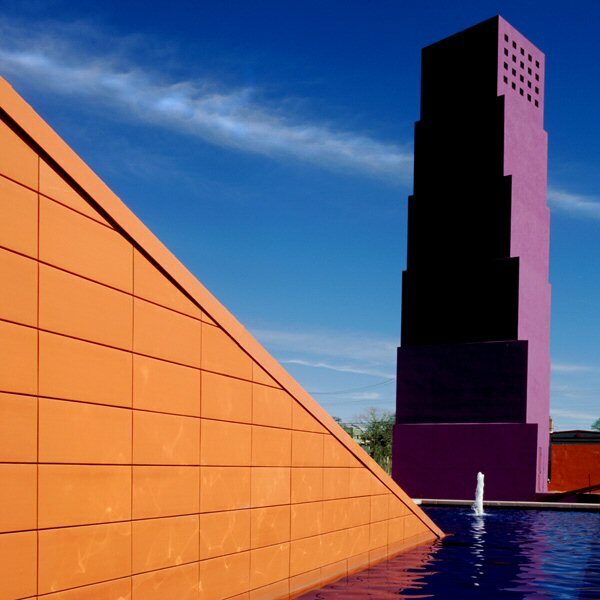 May 7 | 6:30 p.m. and 7:30 p.m.
A free pair of musical events take place back to back within a venue that is a work of art itself that was designed by renowned Mexican architect Ricardo and Victor Legorreta. The first performance will feature mariachi, folk and jazz classics by Big Thought's La Rondalla Guitar Ensemble.Then, at 7:30 p.m., ¡Oaxaca! begins. This performance is the result of a cultural exchange program. Several DSO musicians traveled to Oaxaca for a week-long residency and now, music students from the Mexican city plant their feet in Dallas to participate in this SOLUNA event. These young virtuosos will perform with the DSO's Young Strings students and members of the Dallas Symphony. Expect to hear brilliant chamber music by renowned renowned Mexican and American composers. May 7 | 6:00 p.m. to 8:00 p.m.
Anxiety. Chaos. Fear. Intimacy. 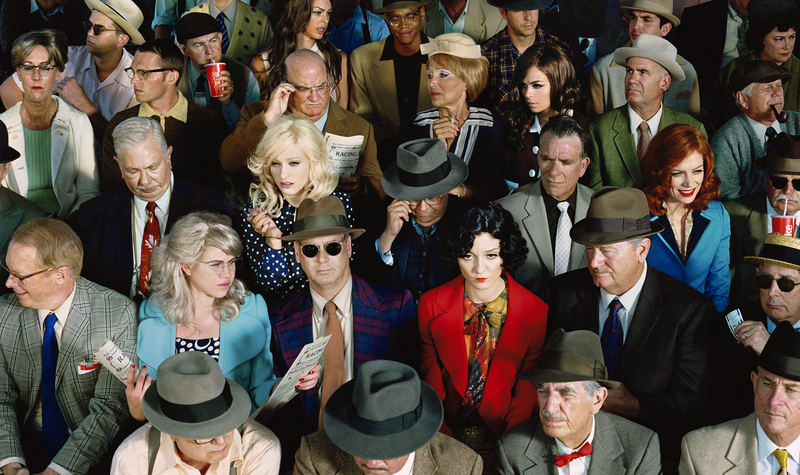 Alex Prager implores these psychological and emotional concepts in her art works of crowds and the individuals within them. In what could perhaps be a live art installation itself, be among the crowd interacting with the American artist herself at the free, Friday night opening reception. New works will be featured about the large-scale photographs and the three-channel video installation. This exhibit will make a home at Goss-Michael Foundation #NearbyMuseumTower through May 25. May 8-9 | 7:30 p.m. The exhilaration of opening night carries well into the weekend, propelling momentum for the ongoing weeks of various art form performances. Tying to the essence of the festival's theme, Destination (America), DSO assistant conductor Karina Canellakis will lead the orchestra through works by European composers who ultimately found their place in America's star-studded city of Hollywood. The world premier of Pipilotti Rist's video work will debut during this performance as well. May 14 &16, 2015 | 7:30 p.m.
Jaap van Zweden leads Bernstein's "Kaddish" Symphony, a poignant expression of faith and freedom, in tandem with teh Children's Chorus of Greater Dallas. Pre-concert, Yael Bartana's film Inferno explores the intersection of culture and individuality. Bernstein's Serenade will be performed by violinist Liza Ferschtman. Artist Jean Shin constructs a metaphor of her heritage in a site-specific exhibition. May 15 | 6:00 p.m. - 12:00 a.m.
A special edition of Crow Collection After Dark welcomes the site-specific exhibition by Jean Shin, an immigrant from Seoul who was raised on American soil. The materials used by Shin for Inclusions and Celadon Landscapes are ceramic discards collected from kilns in South Korea to represent a metaphor of the diaspora of her descent. At 7:00 p.m., Shin will share insights about her work, inspirations, culture and more. Education is eloquently infused in the programming of SOLUNA. At the spectacular Perot Museum of Nature and Science, a walkable destination #NearbyMuseumTower, an outstanding panel moderated by Dr. Mark Goldberg will identify and explore the inherent connections between creativity and cognition. Among the panel of international experts are Dr. Aniruddh Patel of Tufts University, Dr. Gottfried Schlaug of Harvard Medical School and Dr. Joseph Takahashi of UT Southwestern Medical Center. *Note: This lecture is now sold out. May 17 | 8:30 p.m.
St. Vincent isn't too proud to return to her roots. Native to Lake Highlands, the touring Grammy-Award® winning alt rocker will sing and shred with musicians of the Dallas Symphony Orchestra just 0.3 miles from Museum Tower. The sheen and etherealism of her art, complemented and reinforced by outdoor setting of the concert just might make for a unique sensory experience. Tickets are still available. May 22 | 10:00 p.m. Musicians of the DSO and the multi-talented Belgian, Michael Guttman, will play tango music accompanied by the active visual of dance in collaboration with Studio 22. Be sure to bring your dancing shoes.The tantalizing, energizing notes of tango will inspire you to move and there will plenty of space to do so in the ever-idyllic Sammons Park. 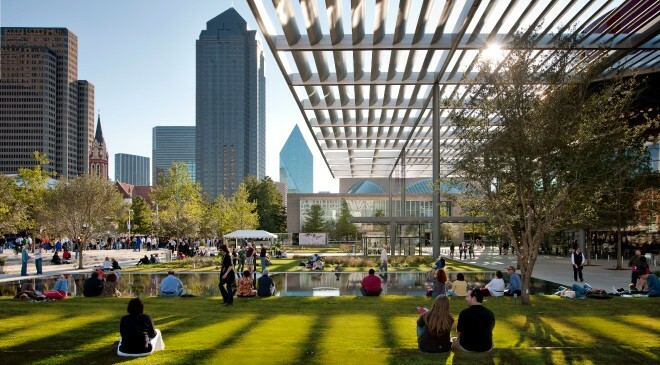 If you can't make this spectacular event, don't forget about the free Tango in the Park on the Muse Family Performance Pavilion in Klyde Warren Park on Sunday, May 31, which features tango lessons and a live DJ. May 24 | 8:30 p.m.
Circling back to this year's theme, Destination (America), Carry The Load and Jaap van Zweden create a united front for Soluna's closing ceremony at Museum Tower's favorite urban green space, Klyde Warren Park. Comprised of patriotic favorites conducted by the maestro, this free performance in the park will give a grand salute to members of the Armed Forces, veterans, first responders and families. van Zweden also told PaperCity that he wants this to be his "personal 'thank you' to the city of Dallas." Much like the opening ceremony, visual art will also play to the music.